It’s time to start bidding! We’re excited to bring back the charity auction this year. 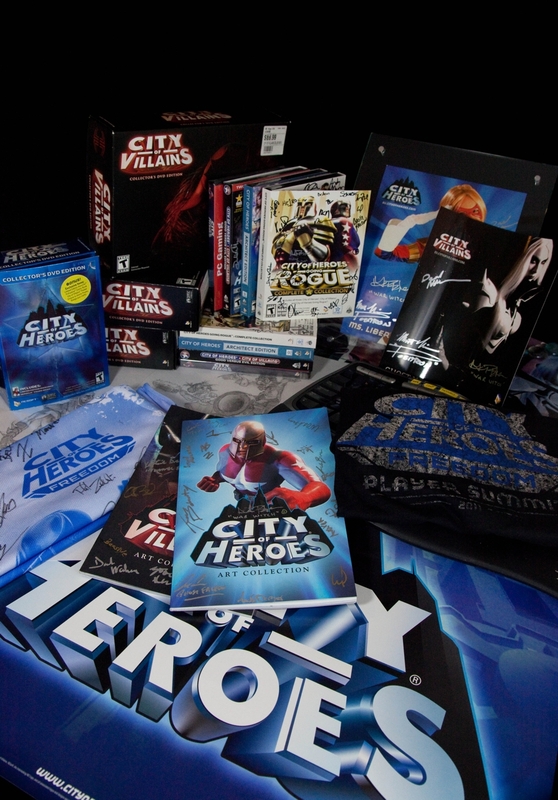 It is sure to once again spark interest within the City of Heroes community and beyond. Once again, we’ve received many generous donations for the auction. Thank you to everyone! Click here to view the auction and bid. The photo above displays just a few of the amazingly cool items in the auctionthis year; A 2011 Paragon Studios Team Shirt signed by a whole bunch of people, a couple of promotional glossies, some beautiful original art, posters, signed retail game boxes, lots of 2011 COH Freedom Player Summit t-shirts, a few costume cards, and a LOT more to surprise you!